SleddersWorld.com Announces Upcoming Release of SledZilla 2018! The NEW SledZilla 2018 Android application represents a new direction for the SledZilla snowmobile software, where all snowmobile brands come together under a single mobile application. The SledZilla 2018 snowmobile app also provides key information and tools that are important to snowmobile owners, with added functionality and user interface improvements. 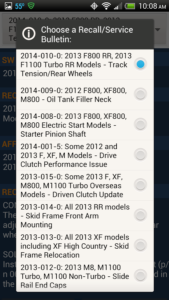 SledZilla 2018 now includes access to the exclusive SleddersWorld.com Snowmobile Recall and Service Bulletin database for all four major snowmobile manufacturers, Arctic Cat, BRP (Ski-doo), Polaris, and Yamaha*. There is no longer a separate application for each snowmobile manufacturer. Additionally, the data is now accessed offline, without the need for an active Internet connection. 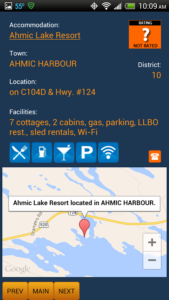 The app also includes offline access to Kris Roenigk's Ontario Accommodation Database with searchable town/city listings, ratings, amenity listings, as well as contact information. SledZilla 2018 also includes a snowmobile tools section that provides key data to sled owners, such as fuel/oil mixture, bore size, and gearing calculators. The app is completely free. Donations to support future add-ons, improvements, and enhancements are greatly appreciated, but not required. The SledZilla 2018 Snowmobile Recall/Service bulletin database is updated frequently as new information is obtained and will automatically be available to the SledZilla 2018 users. * Please note that the SleddersWorld.com Snowmobile Recall and Service Bulletin database, while comprehensive, is not sanctioned by any snowmobile manufacturer and relies on users, like yourself, for passing along bulletin/recall information. It is not all inclusive and SleddersWorld.com makes no representation that the recall/service bulletin database is complete in any way. The information contained in this database constitutes that data that was able to be obtained by SleddersWorld.com only. Contact your dealer for your model specific questions or for a complete list of recalls or bulletins that may affect your model. NOTE: Please email any application enhancement recommendations OR recall/bulletin information to webmaster@sleddersworld.com. We would like to hear from you for ideas on additions to the software.